If you are looking to tan your skin indoors, it is essential for you to get a good indoor tanning lotion that will give you the type of results you desire. Using the right lotion is going to speed up tanning, give you healthy skin, and keep you bronzed for longer periods of time. Due to the rate at which skin care products are produced, it is no surprise that there are a number of options to select from with many brands offering multiple features. We have prepared this review of the best five indoor tanning lotions. Before going into explaining the best five indoor tanning lotions we need to understand what an indoor tanning lotion is. We will also consider the difference between it and a regular sunblock. What are the Types of Indoor Tanning Lotions? How Can You Tan Safely Indoors? How to Know the Best Skin Type for Tanning? What are the Best Indoor Tanning Lotions? Indoor tanning lotion is going to make you tan faster when compared to laying outside under the sunlight. Self-tanners are designed to color or dye the skin for only a few days. A sunblock is meant to keep the Ultra Violet rays from damaging your skin when laying outdoors under the sun. It is a smart move to make use of sunblock when outdoors because of the type of UV rays the skin receives can be unpredictable. So depending on the condition of the weather, and the altitude, as well as the length of time you will spend outdoors in the sun, you could suffer from serious burns without a sunblock. It is important to indicate that it is unwise to use your indoor tanning lotion outdoors because it magnifies Ultra Violet rays as opposed to blocking them like sunblocks. The same thing goes for the sunblock. You shouldn’t use sunblock on a tanning bed. The reason for this is because the chemicals in the sunblock can damage the acrylic in the bed and you won’t get your tan in the end. When it comes to self-tanners, some brands of indoor tanning lotion include bronzers that will color your skin, which can be washed off in the shower. When it comes to indoor tanning lotions, you must understand that there is more than one type. Some tanning lotions are designed to work by increasing blood flow to the skin’s surface so as to facilitate the production of melanin (the pigment in skin that typically makes your skin look tanned). Additionally, some indoor tanning lotions, particularly tanning lotions that include menthol, create a cooling sensation on your skin as you tan indoors. The majority of indoor tanning lotions come with silicone as their base because it does not create an oily film on the screen of the tanning bed. Normally silicone will help your skin because it usually seals in moisture while other brands of tanning lotions depend on a chemical composition called dihydroxyacetone also known as DHA. DHA is a substance you will see in many self-tanning creams. The compound is a sugar that is designed to cause the skin cells that are dead and the amino acids in the epidermis to darken during tanning. The effects of this chemical can last for about one week after tanning. However, it has to be said that researchers have investigated whether long-term use of DHA may damage your DNA. Although for the purposes of this content we selected a few indoor tanning lotions that contain DHA, we also a few that do not contain it. Hence, much like any other skin lotion, cream, or skin cleanser, it is always an excellent idea to use it on a small part of your skin for a day before deciding to spread it throughout your body. It is essential to indicate that tanning is a delicate process hence you have to be careful during the endeavor. We always advise people who are not familiar with indoor tanning, to take it slow when attempting to tan indoors. You can make sure your sessions only last for a few minutes. Make sure you follow the advice given by the tanning staff and be easy on your skin. Make sure your eyes are protected before engaging in the exercise. Don’t forget to use your goggles and lotion. Remember to hydrate properly before indoor tanning. In the end, if you follow the tips mentioned here, you will be thankful in your later years. 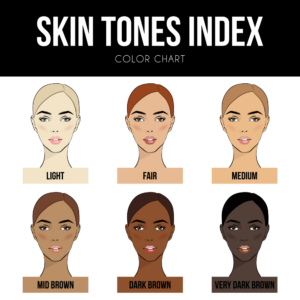 Note that different skin colors typically tan in different ways. Knowing your skin type will help you decide the length of time you will spend during tanning and the type of lotion to use during the process. Knowing your skin type is crucial to the type of results you desire from tanning. #2: This skin type can be tanned slowly and carefully. #3: People who can succeed in tanning but burn occasionally. #4: People who can tan quickly and almost never burn. #5: Includes people who hardly ever burn. They are usually tanned deeply. #6: People with skin that tanning will affect partially because their skin is very dark already. The Ed Hardy Coconut Kisses tanning lotion is a fully flavored lotion designed to help users get a nice bronze in the absence of fading your tattoos. This product also contains tyrosine and a special melanin formula, which may help to darken your skin quickly, but not that it doesn’t include a self-tanner. The Ed Hardy Coconut oil tanning lotion comes in coconut oil and cocoa butter flavors both of which are adding a nice scent. Unlike many other indoor tanning lotions, you may be able to use it on a tanning bed or under the sunshine. The manufacturers of this indoor tanning lotion alleged that its ingredients could diminish cellulite, which inevitably makes the skin firmer and younger. The Millenium New Solid Black Bronzer indoor tanning lotion is a silicone-based lotion that may darken your skin tone. It appears the product does this as quickly as possible even before you lay on the indoor tanning bed. The reason for this is that The Millenium New Solid Black Bronzer indoor tanning lotion contains tyrosine, which is a compound that increases melanin production and darkens your skin. This product is a fully packaged tanning lotion filled with moisturizers including walnut seed oil; pecan seed oil, sunflower seed oil, and hemp oil all of which may help your skin stay healthy during tanning. The manufacturers also alleged that the product contains vitamin E (tocopherol), chamomile, and willow bark will help to soothe your skin fast during and after the tanning process. The Millenium New Solid Black Bronzer indoor tanning lotion usually does not cause streaking or turn skin into orange; however, it is going to deepen your tan. It appears that this tanning lotion has a pleasant scent and goes on the skin smoothly. However, there is a downside. The ingredient list shows that parabens and DHA are included in the composition. The Millenium New Paint It Black Autodark tanning lotion from Millenium is allegedly designed to give users the darkest tan possible. This tanning lotion is silicone-based just like the Solid Black indoor tanning lotion from Millenium, but with this product, there isn’t any tingle additive. The silicone included helps to soften your skin to maximum, which in turn makes it feel younger and firmer. You will find that The Millenium New Paint It Black Auto-dark tanning lotion is not greasy. In fact, it may actually go on smooth, and allegedly does not streak, or rub off on clothes. The lotion has a fresh cotton scent, which may be very pleasant to users and helps to mask the odor that comes after tanning your skin. This product also contains parabens and DHA like the Millenium Tanning lotion mentioned above. The Brown Sugar Black Chocolate Coconut 200X Tanning Lotion is a fully flavored lotion. It may be a good option for people who love the aroma of coconut. This indoor tanning lotion contains a number of anti-aging antioxidants derived from dark chocolate and extracts from Argan plus silicone and coconut oil to moisturize your skin during the tanning process. This tanning lotion doesn’t contain parabens or DHA. According to the manufacturer’s reviews, users say if they remember to wipe their hands after applying the Brown Sugar Black Chocolate Coconut 200X Tanning Lotion, they will typically see streaks or orange colors on them. The Brown Sugar may deepen your skin tone as you undergo tanning, even if it is just only a few minutes per session. The Supre Snooki Ultra Dark Black Bronzer tanning lotion by Nicole Polizzi is allegedly a long lasting tanning lotion. The lotion doesn’t include parabens in its chemical combination. Although it includes DHA will is believed to make sure the skin continues to darken even up to a week after your tanning session. The Supre Snooki Ultra Dark Black Bronzer tanning lotion is a dark bronzer a reason why when you are applying the lotion add black walnut and henna. This combination may make your skin appear sun-kissed before it is actually exposed to UV rays. According to the manufacturers of this indoor tanning lotion, it allegedly contains sweet-smelling almond oil and coconut flavor, which is believed to help keep your skin soft. The lotion claims to contain vitamins that can help protect and nourish your skin. There is a tingler included as well which may help to dilate your blood vessels ultimately stimulating your melanin production. This process makes tanning easier. Tanning is a delicate process hence it must be done carefully. The skin type of the individual being tanned should be put into consideration before a tanning lotion is picked to perform indoor tanning. Our pick from the five best indoor tanning lotions is the Supre Snooki Ultra Dark Black Bronzer tanning lotion. The Ultra Dark Black Bronzer tanning lotion has DHA, which allegedly enables your skin to remain dark even after you round up a tanning session. The effects of The Supre Snooki Ultra Dark Black Bronzer tanning lotion may last for a week after use according to the manufacturers. This indoor tanning lotion contains sweet-smelling almond oil and coconut flavor both of which may help keep your skin soft. This lotion has a range of vitamins that may help to protect and nourish your skin. The lotion may also stimulate the melanin production in your skin to facilitate tanning. So if you are looking for a tanning lotion that may give you adequate protection and tanning, The Supre Snooki Ultra Dark Black Bronzer tanning lotion may be ideal for you.